Xochi has been working in ceremony and walking the red road for the past 10 years. Her ancestors called her back home, after traveling in Europe and Asia for 4 years. Ever since her return, she has immersed herself in ceremony and working with the elders. She works with the Mexica and Mayan Culture and as well as the Lakota as a metis women. She was initiated into an ancient form of healing and divination in Guatemala by her adopted grandmothers and now carry’s the fire back home to share with her people. 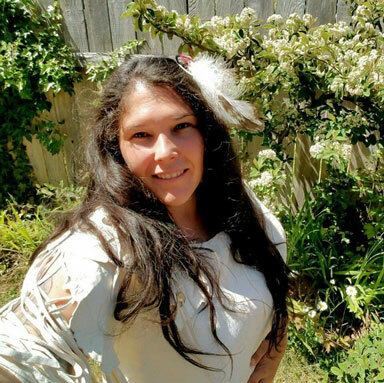 Xochi owns her own business and creates native American regalia and medicine tools for a living. She has owns an online store and offers regalia such as ceremonial clothing, buffaloskin moccasins, Buckskin medicine bags, to rawhide drums and rattles. She was born in Southern Humboldt, but now lives in Eureka, CA on her folks property. There she owns a tiny house and yurt studio where she dedicates creating space for native American ceremony, art, and classes. She holds community ceremonies most the year. From monthly womxn full moon ceremonies, known as the Dreamlodge, to community womxn sweats, and Mayan Fire Ceremonies once per season. She also offers personal healings and personal ceremonies in traditions of the south. From Mayan Divination that reads beans or tobacco to a 3 hour long personal Mayan Fire ceremony where as an Aiq’ij she calls in the Ancestors and divines the movements of the fire and Spirits. As well she does Limpias, which are simply a healing/cleansing using medicine tools of Mexico. To a longer form of limpia as well, known as Nahual Medicine Healings. Here she takes the client to walk around the medicine wheel and call in their ancestors. Then they climb up onto the table in the center of the yurt where they lie on a full wolf pelt. More animal hides, bones, claws, wings, ect are used during the healing, along with plant bundles, crystals, and drums and rattles. It is an energetic healing in the traditions of curanderismo. Xochi also started teaching classes last year. She teaches Native American Art Classes, where you learn to make different Sacreds. Her passion is a 9 Moons Birth Series which is an intensive womb healing series using indigenous teachings. Every month they meet near the new moon inside a tipi and around a fire to dive into a mediation, ceremony, and learn indigenous teachings of the womb. It is a perfect class series for women wanting to prepare to get pregnant. Next year she hopes be starting a 13 moons Girls Initiation Series. Based in indigenous teachings as well, it is open to all girls from age 10-13. IT is a coming of age series emphasizing supporting girls of color, tho open to everyone.